Following the trend of telecom API consolidation BICS has bought Telesign. I prefer to use the term programmable telecoms, as you can see in the diagram below the market is much more that just APIs. Services using programmable telecoms have become an essential part of the market, and underpin Telesign’s success. BICS (previously known as Belgacom ICS or Belgacom International Carrier Services) operates as a subsidiary of Proximus Group, and provides wholesale carrier services to wireline and wireless operators, and service providers globally. They have lots of interconnect agreements around the world, with great wholesale rates. Telesign is a cPaaS (communications Platform as a Service) with a focus on security, the company focused on two-factor authentication services, a secure supplementary method of preventing illicit access to online accounts used by the likes iTunes, Yahoo, Gmail, Outlook, Twitter, Facebook, Bank of America, Chase, Discover, PayPal, Etsy. The company was also giving more focus to its cloud communications APIs, given the successful IPO of Twilio and exit of Nexmo into Vonage. Telesign also shows the importance of delivering more than APIs, which are commoditizing, they focus on services. Businesses want solutions to problems not only an API that they then have to build upon. Their acquisition confirms the trend of aggregators buying cPaaS providers. CLX buying Sinch is another example. 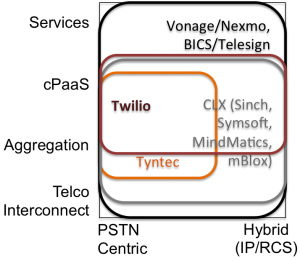 I also mentioned Tyntec in a previous weblog, as they consolidate across this programmable telecoms market in the US market. I show below a view of how this consolidation is mapping out for illustration purposes only (don’t get bent out of shape if you disagree, its just illustrating a point not a definitive diagram) with a few of the players mentioned, there are many more than listed here. The devil really is in the details as the mapping masks many regional variations on focus and extent of direct carrier interconnect, some telcos force players to work through middlemen/trolls, and the service focus of the players is quite different in this mapping. The Hybrid (IP/RCS) line is much more complex than shown here as everyone is taking a different approach, some are focused on the Android RCS ecosystem, some have their own RCS server, some have messaging APIs that include popular IP messaging platforms, some have taken a more WebRTC approach. BUT regardless they are all focused on covering more than the PSTN space. The money is clearly in SMS today with a retail price of 0.5c per message, while for IP messaging AWS SNS is 0.00005c per message. History shows us where the market is going, and that factor of 10,000 difference in price is a significant driver. Being trapped in a business model that relies solely on a message being 0.5c in the future will be in a tough position. 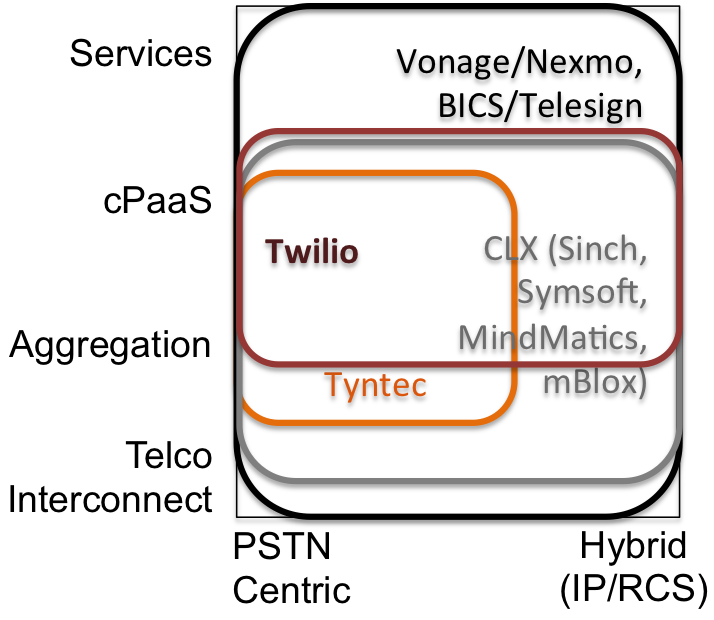 CLX Communications is mapping across this space given it bought not only Sinch, but also MindMatics out of the Xura mess, Symsoft for its telecom app platform (which includes RCS), and mBlox. Its building out a broad services, aggregation and cPaaS offer. Given it has its own a RCS server this enables a broader IP messaging aggration role beyond just being part of the Android RCS ecosystem. Nexmo / Vonage are focused on enterprise services, and run on the back of Vonage’s global network for voice, and Nexmo has built-out quite a few direct SMS interconnects with carriers. Telesign brings services and cPaaS on top of BICS global network, which includes direct carrier interconnect. I reported on Tyntec recently given their announcement in breaking the Syniverse / SAP duopoly in the US. Allied to all this is a broader A2P (Application to Person) landscape, which includes Facebook Messenger / WhatsApp, LINE, WeChat, Viber, Telegram, Wire, Slack, etc. Which roll their own IP messaging, voice & video. And whose costs are closer to AWS SNS, as its just cloud compute resources. With business models not linked to transport per message or minute or connection, rather eyeballs and compute. I must give a note of caution on black and white thinking at this point, enterprises just need stuff to work across all their customers / employees / partners – not partially work. This market is getting more complex and dynamic, we’re going to see some even bigger M&A in the coming years as the market expands. Programmable telecoms democratizes the technology which connects people and things, TADHack Global is the place to meet the companies leading this movement and discover what programmable telecoms can do for you. Thanks to Matrix, Telestax, and Temasys for being the initial sponsors of TADHack Global 2017, we’ll be adding many more sponsors and partners over the coming months. Its an exciting time, as more and more people discover the power of programmable telecoms.